When you consider a large portion of income made by many artists is generated from their live shows, it is now more important than ever for performers to learn how to take complete control of a room and put on a show that helps them stand out in a very crowded field. 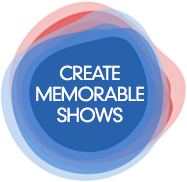 Our live show production have been proven to help artists accomplish three things: put on a more entertaining live show that fans love, get more fans to visit your merch table, and convince more fans to sign up for your direct marketing lists! And we can help you in person as well as via Skype! You should check out our blog post – What is a Live Music Producer. Please Note: Packages are available at a discounted rate.